But then I saw this super cute idea and thought it was awesome to see other seasons with the die – in this case Christmas. The nice thing about the die is that that it is super fast to put together because the die does all the cutting and scoring for you. 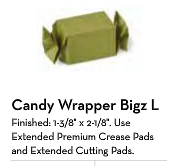 You just have to fold the sides together, slide in your treat, twists the ends, and EMBELLISH! Plus, check out some of these fun touches! 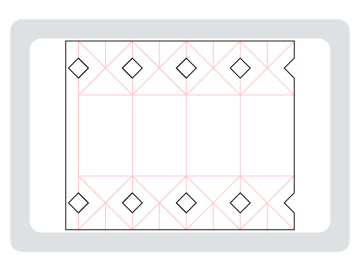 I love how the outline of the scallop square is colored with a Cherry Cobbler marker. I always use Sponge Daubers to edge my shapes, but I love how precise you can get with the marker on a bumpy image like the scallop punch. Plus, the added bling you get with the Dazzling Details glitter glue on the dots is so small but it adds A LOT when you see it in person. Don’t You Just Love This Reindeer? 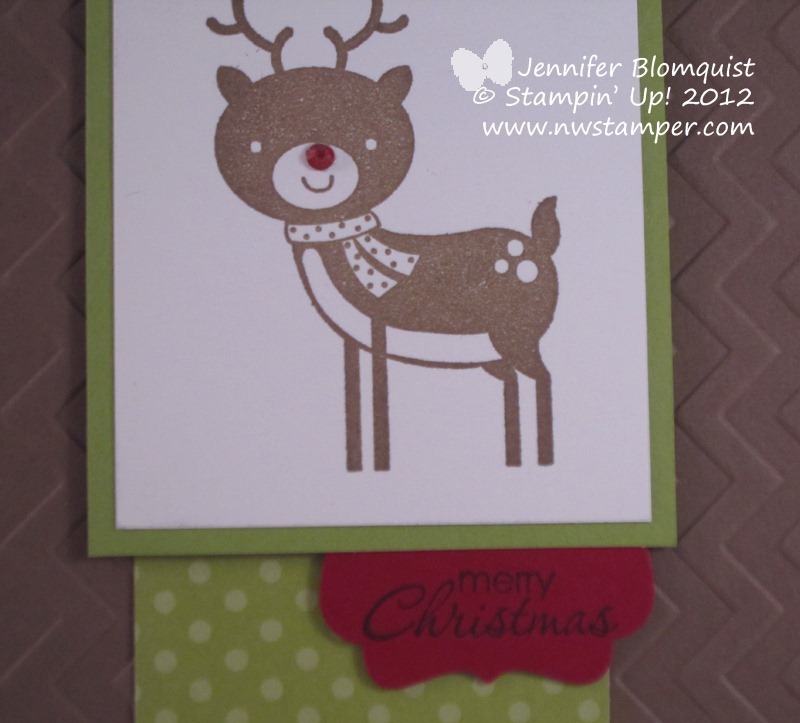 I know, I just shared another card with this stamp but isn’t this reindeer sooo cute? 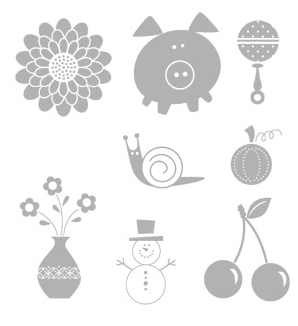 🙂 I was having a bit of fun with this stamp set – No Peeking – and seem to be having a love affair with “cute” stamp sets, so I hope you don’t mind! 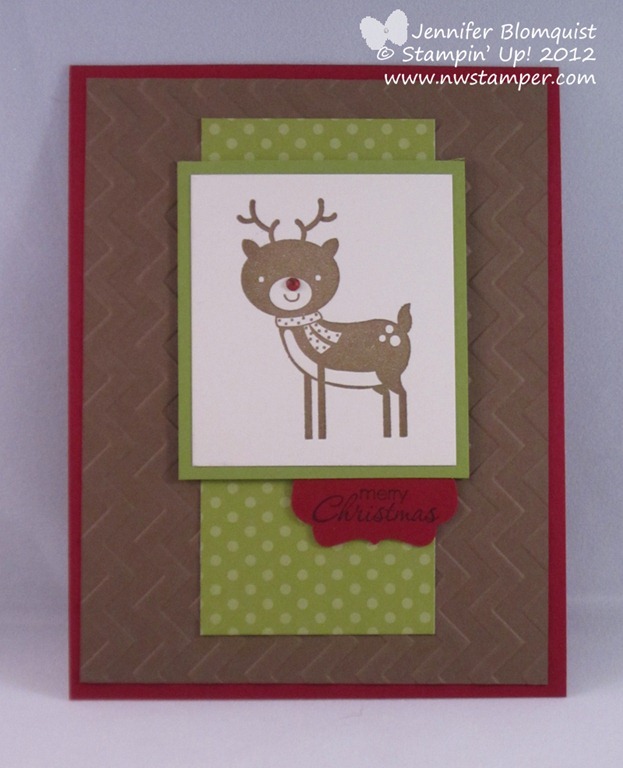 This is an idea for a quick and cute holiday card that you can easily produce a lot of in a little amount of time –especially if you use one of the bigger clear blocks to mount the sentiment and the reindeer on the block at the same time. 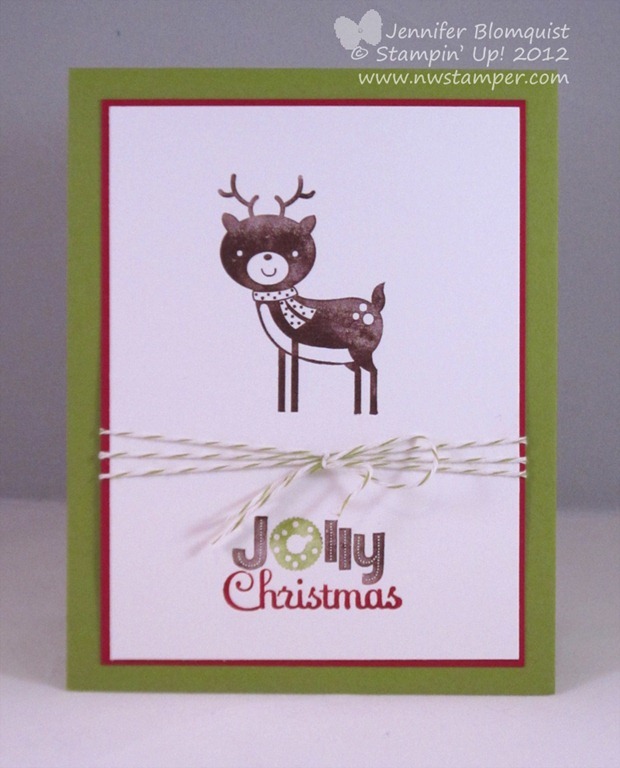 Then just ink up your reindeer with your Early Espresso ink pad and your sentiment with markers! 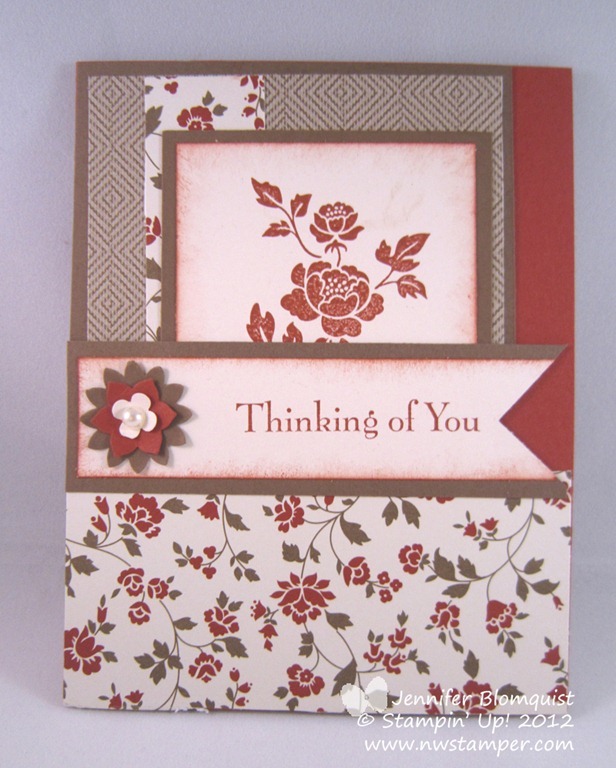 Tie some matching baker’s twine around the card and you have a sweet card that is ready to go! 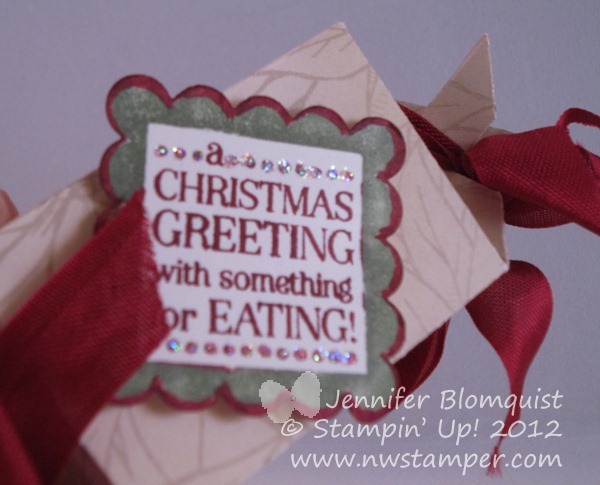 This is another card I got as a swap and helped make me fall in love with the No Peeking stamp set. Seriously, how cute is this reindeer? 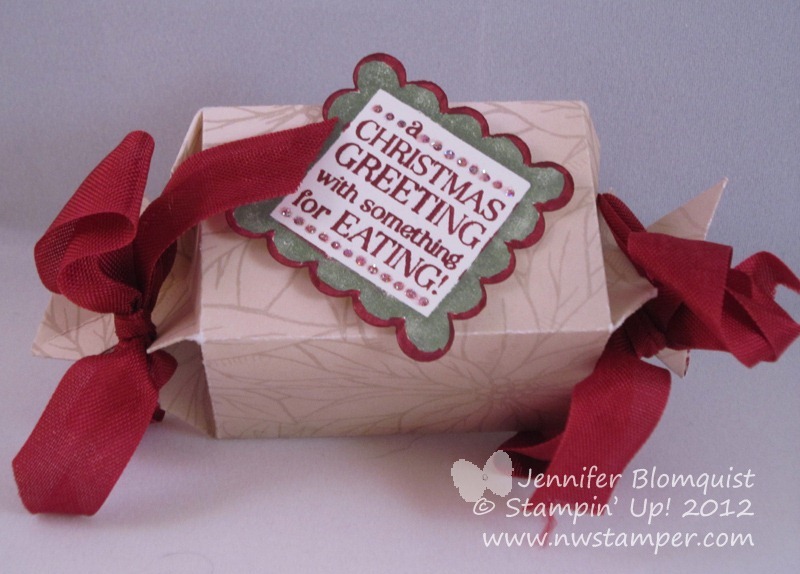 Its also quick to make and another great use for your scraps of designer paper. And did you see that nose? Take your rhinestones and color them with a sharpie to get custom rhinestones in any color! Cool, huh? 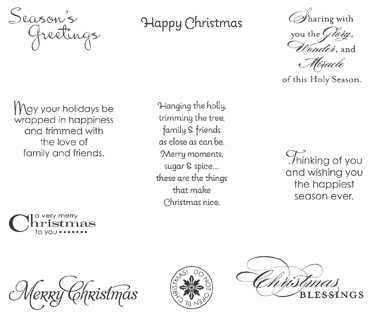 Well, I’m off to do some family activities this morning before my final Christmas Card stamp-a-stack for the year. Tomorrow I’ll share more of the cards we are making this afternoon! See you tomorrow! When I was getting ready for Creating Keepsakes this year, I decided to highlight the Button Buddies stamp set and made a set of fun cards using each of the stamps in the set. 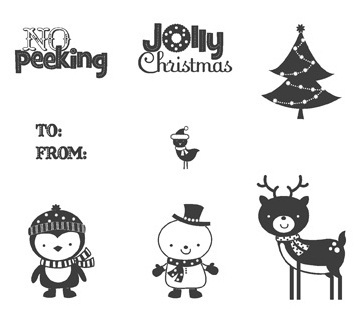 One of my favorite cards was using the snowman stamp… so much so that I decided to use it for my last Christmas Stamp-a-Stackthis coming Sunday. I love cards like this that look detailed but are simple to create. A couple punches ( 2 3/8” Scallop punch and the Scallop edge punch), an embossing folder (Perfect Polka Dots), and some stitched grosgrain ribbon. And tada! Oh, and it was hard to show in the picture but I outlined the Whisper White circle with Dazzling Details glitter glue to add a touch of sparkle to the card. Other sale items that go great with this card or set! First, let me start by wishing you all a very Happy Thanksgiving! Whether you are with family and friends for the holiday, or just having your typical day at home – I hope it is a wonderful day for you! I always love the time to get all of our family in the area for an afternoon of relaxing and eating an awesome meal – especially when it is like this year and I am not hosting! 😉 I love having people over, but after the last year or two hosting Thanksgiving and Christmas, it is kind of nice to get to take food to someone else’s house this time. Well, before I head out to eat way too much good food – I thought I would share a thank you card I made with my group in our last team meeting. It is a great clean and simple card that doesn’t take a lot of time or supplies but looks really nice in person. This is the technique of using a clear block to stamp a background image. I used my ‘H’ Clear Block and inked it up with Crumb Cake ink. 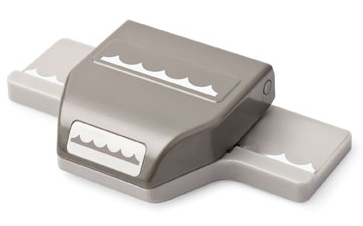 Stamp your block directly to your card base, if you don’t get a solid image – try again either with your cardstock on a softer surface (like on a magazine) or pick up your cardstock and block and flip them over so you can rub the paper to help pick up the ink. 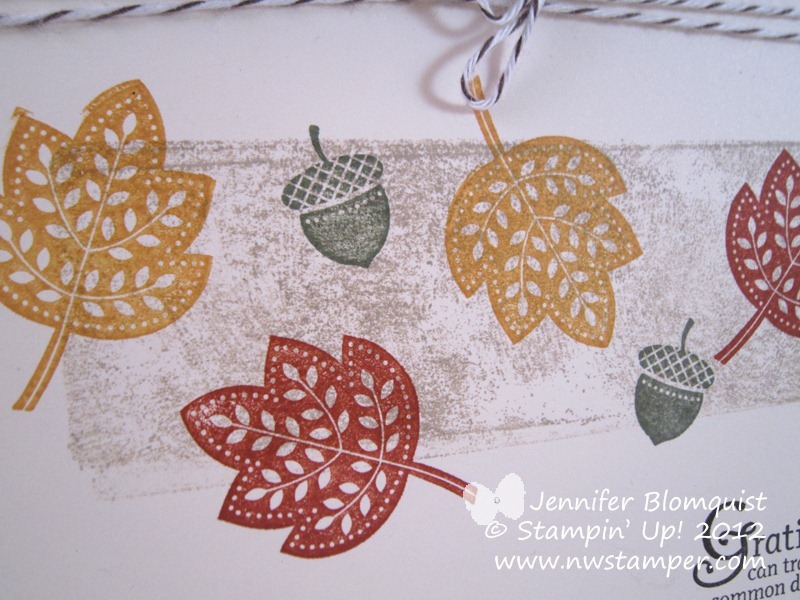 Then stamp your images – in this case, leaves and acorns from the Day of Gratitude stamp set. Then, just add a bit of bakers twine, to the top and you are done! 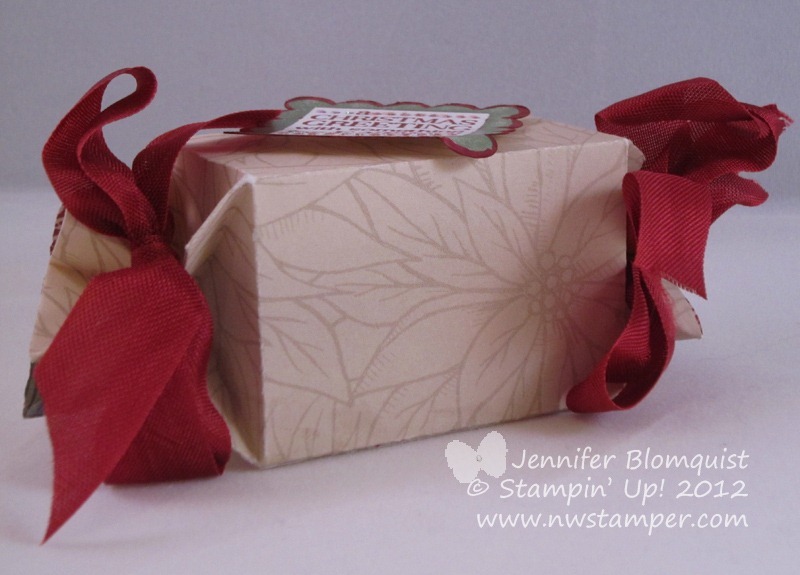 For those of you still planning your order for the Stampin’ Up! Online Extravaganza sale, I wanted to let you know that I saw this morning that 2 items currently available for 30% off are running low. That means, if they run out before the sale is over, orders will go on backorder and they expect that it will take until January to fill those orders. yikes! Are you in the party and festive spirit yet? I know for me once the Christmas music starts up in the stores and the sparkling lights and ornaments come up, I feel like its party season – even though I don’t go to that many parties (thanks to two small kiddos) but I still love the idea! 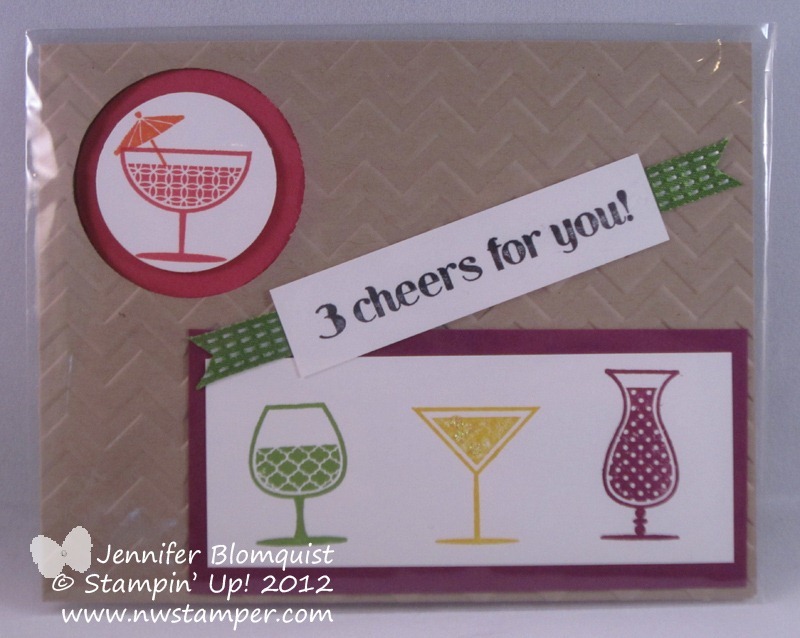 That is probably why I am drawn to the Happy Hour stamp set. It makes me think of friends, great conversation, and cheers and toasts all around! And did you see it is on sale as part of the Online Extravaganza?! Those darn holiday sales, makes those fun things you’ve had your eye on for a while all the more tempting because of the discounts! In this case, Happy Hour is on sale for 25% off. You can also get a ribbon bundle that includes this Gumball Green stitched satin ribbon for 25% off too! Anyway, back to the card. I didn’t do the best job taking pictures, but I was trying to show off what I thought was a cool element of the card – the popped up glass in the upper left corner of the card. It is a 1 3/4” Circle punch out of the card front itself. Then punch a 1 3/4” Circle out of Primrose Petals cardstock and glue it to the inside of the card so that it shows through the hole in the front. 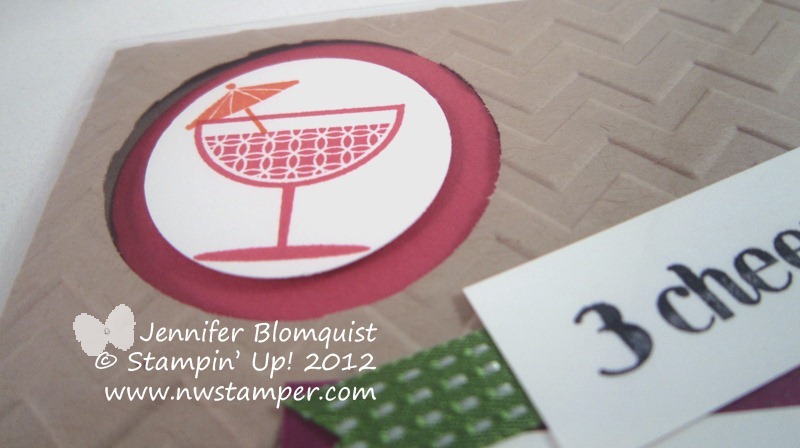 Then stamp your glass on Whisper White paper and punch it out with the 1 3/8” Circle punch and adhere to the center of the Primrose Petals circle using Stampin’ Dimensionals. It makes for a really cool look in person. Want the set while it is on sale? You can find it here in the online store.